It is strange, perhaps, that a marque, as eloquent as Rolls-Royce doesn’t have a museum of its own. Fortunately, some privateers have devoted a museum to the noble marque. One of them now sells out its complete collection. Plenty of Rolls-Royce museums on the European continent. You will find one in rural Spain, another one in Switzerland and no less then two in Austria. But one of the Austrian-based open-to-the-public collections will now disappear as 64-year-old Hans-Günther Zach decided time has come to sell out his complete collection in Mühlheim. The majority of Zach’s Rolls-Royce cars are of pre war-vintage and best known is without doubt the Phantom II 40/50 HP Continental, known in Roller circles as the ‘Star of India’. The car, bodied by Thrupp & Maberly, was delivered in India in 1934 to Thakur Pradyumansinh Jadeja, better known as the Maharaja of Rajkot. Rumour spread soon after Zach’s intention to sell out his museum and price indications of 10 million euros for the ‘Star of India’ alone spread over the net. However, that seems a bit of an exaggeration, as Zach supposed to have said he was thinking of 5 million for the complete collection, including three Bentley cars and a wagon load of antique furniture. Zach’s collection does contain some other interesting cars though. 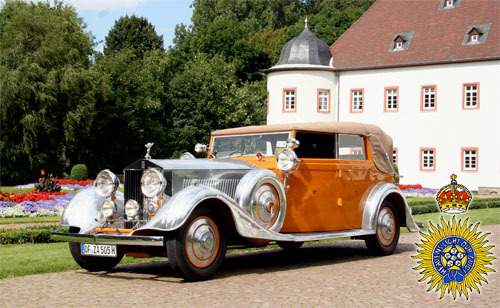 See a list of his coachbuilt Rolls-Royces below. More information and images of each car can be seen here.